Repairing all of Wrexham's potholed roads could cost up to £50m, a senior council officer has revealed. Councillors have bemoaned the state of the county borough's roads, which attracted 400 complaints in one month. Darren Williams, chief officer for environment, said he would prefer more permanent repairs to be carried out. But he said quick fixes were more affordable with the current funding available to his department for mending roads standing at about £2.7m. "I'd love to be able to be in a position where we don't do any reactive repairs," Mr Williams told councillors on the environment scrutiny committee. "The fact of the matter is that to protect the council against claims and insurance, we have to fill holes. "Often the only way to do that is with a very rough and ready approach to filling the holes, which is a bucket full of tar. "It's not satisfactory, we don't like doing it, but that is where we are unfortunately." 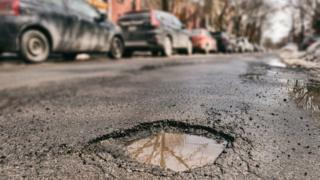 Can Wales' pothole problem be fixed? Councillor Mike Morris said he felt rural areas, such as his ward of Holt, were being ignored with some roads taking in excess of six months to be repaired. "There are certain areas where it's not just a two-inch-deep pothole, you've got part of the carriageway subsiding into open water courses," he said. "They're literally failing and falling apart." Councillors voted to note the performance figures on road repairs and will also receive a further update next month, according to the Local Democracy Reporting Service.